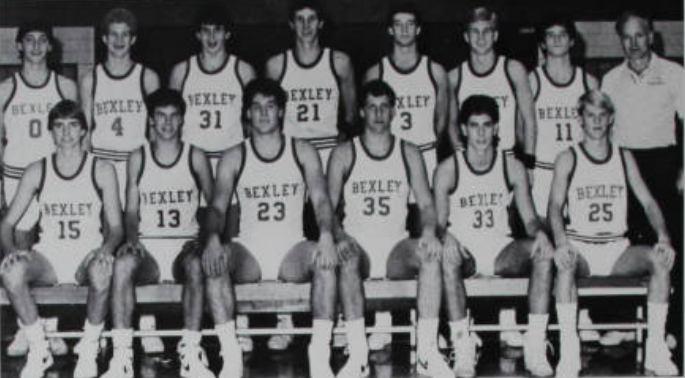 The 1985 Bexley High School Boys Basketball team will be celebrated on Saturday, January 26, 2019, thirty-five years after remaining undefeated, 20-0 in regular season play. The team also won the C.B.L Championship and earned Bexley its seventh District Championship. Team starters included: Matt Copp, Paul Daily, Bill Hoyer, Bill Kumler and Mike Millard. Bill Hoyer was named to the All-League, All-District and All-State teams. Team members, along with their head coach Gene Millard, will be recognized on the court in between the Bexley High School gymnasium between the junior varsity and varsity home games. The public is invited to attend. Millard coached boys’ basketball at Bexley from 1962-87 and again from 1992-96. He won 496 games, 15 league titles and eight district championships, along with the 1983 state title. Millard was inducted into the Ohio Basketball Hall of Fame in 2011. The Bexley High School gymnasium is named in his honor.